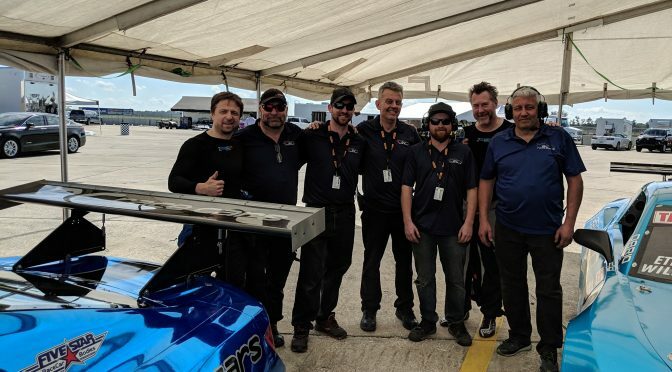 It has been a mixed beginning to the 2019 racing season in SCCA Pro Trans-Am for the BCR team of Camaros. We unload well off the trailer, always quick in testing and practise, qualify well but have missed the podium at both Sebring and Atlanta. Our cars have the speed; just the podium has eluded us so far. At Sebring, both Misha and Ethan were quick in practise but “only” qualified 6th and 7th respectively, having missed the balance just slightly. Ethan drove a great, steady race and finished a respectable 6th. Misha had an engine electrical glitch right before the race and had to start from the pits. He drove right up to 9th, turning some awesome laps in traffic, but suffered a cut right front tire and could not continue. Round two at Road Atlanta had the highest of highs when Misha put the #10 BCR Camaro on the pole, with Ethan a strong 6th in the #25 car. This marked the first pole for BCR, a monumental moment for a small team and a testament to our crew and Misha’s driving talent. Unfortunately, the race did not go our way. An incident with another car forced Misha off track and dropped him out of contention. He came back to finish 10th. Ethan, on the other hand had a great race! He was consistent and quick, earning a well-deserved 4th, matching his career best! Although we all dream of being on top of the podium, we are truly grateful for having two very talented drivers and the exceptional BCR crew working together and striving for great results.